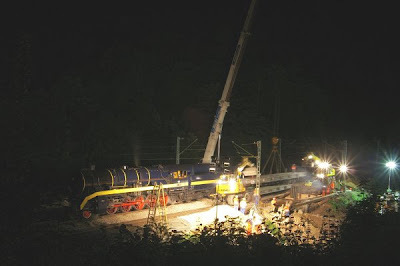 One night in August 2007 this was heading a construction train in connection with the installation of a new bridge on the Swiss railways at Thayngen. The steam engine proved popular for permanent way and works trains especially at night because it is practically silent when stationary and less obtrusive when working, which was appreciated especially by local residents. This was not the whole story either, because unlike a diesel, which is constantly idling even when stationary, no fuel is used while in standby mode. When all the sums are done, it turns out that the greater thermal efficiency of the diesel is negated by the cost of processing the fuel to make it suitable for use in an internal combustion engine, and in these standby losses. Hence it has been found that on the Swiss and Austrian mountain railways where both steam and diesel locomotives run on the same diesel fuel, the former use less as they consume nothing when stationary or running downhill. The locomotive was rebuilt from a German Kriegslok constructed in 1944 and intended for no more than a few months' service. The work was carried out by the Swiss engineering company Dampflokomotiv- und Maschinenfabrik DLM AG of Winterthür. Improvements were incorporated to provide for quick startup and efficiencies around 50% higher than the best that was being achieved when steam locomotives were last used regularly in the 1950s. Steam locomotives are in many ways ideal for rail traction, where demand for power is intermittent, for example, when starting, accelerating, and on uphill stretches of route. Because the boiler acts as an energy reservoir, the conversion of the chemical energy in the fuel to mechanical energy is separated off from the use of that energy to provide traction. In an internal combustion engine, on the other hand, the engine where the conversion of fuel to mechanical energy takes place has to be sufficiently large to provide for the maximum power demand. And being external combustion devices, steam locomotives are not particularly fussy about the fuel that is used. The use of waste materials is relatively simple and thus the machines can be carbon-neutral. Steam locomotives are in principle simple, with direct drive from the cylinders to the wheels. By contrast, internal combustion engines used for rail traction require a complex and expensive electrical or hydraulic transmission system, with consequential high manufacturing and maintenance costs and energy losses. Given a reasonably long production run, the cost of steam locomotives should be less than 40% of the equivalent diesel electric. Unfortunately, there were no takers for the technology, which still has to recapture its credibility amongst conservative railway managers who dismiss it as obsolete. It is unfortunate, however, that the obvious advantages when used, as here, for maintenance trains, have not been recognised.